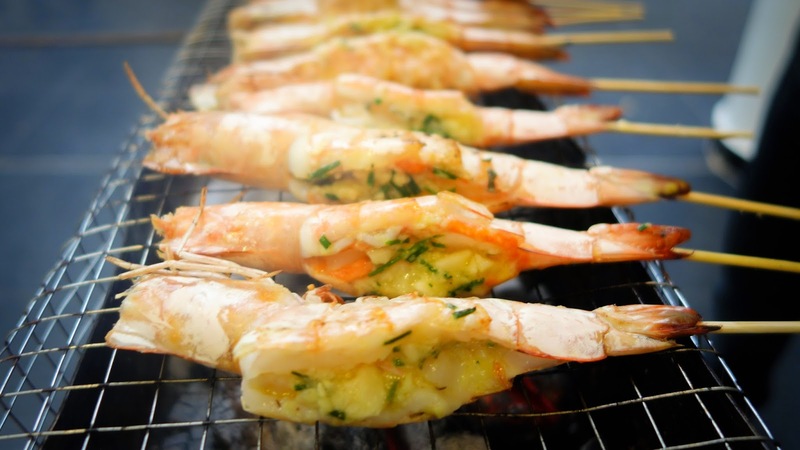 Char-grilling foods is a great way of cooking. As old as humanity, this must be one of the earliest forms of cooking. Burn some wood. Warm yourself up in the cold. And hang some meat over the fire. My earlier experiences of BBQ are in my youth camping days. It was almost always chicken wings and sausages galore. In part it is because these are cheap. The wings were of course mostly "chow tar" (burnt) from the sugar or honey in the marinade. We did not know any better. Even then, grilled chicken wings always excite. Somehow. Now all grown up, we do not grill our food regularly because of our weather. Most S'poreans stay in flats and they do not want to smoke up their habitat. So if we do the occasional BBQ, it is almost always for parties and special events. And with the Deepavali holiday round the corner, I am sure some are planning to do BBQs. I have hosted many BBQ parties over the years. I thought writing about my experiences here may help you to plan for your occasional BBQ events. 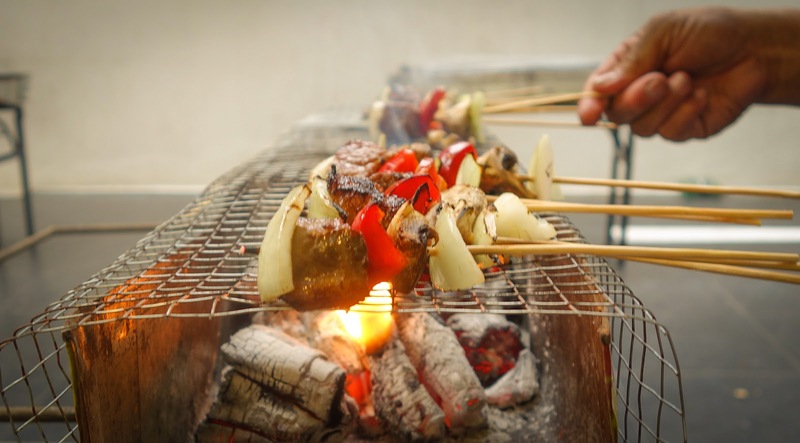 With a bit of planning and creativity, you can have a good, enjoyable and affordable BBQ. One good thing about BBQ is that one can truly say "anyone can cook." 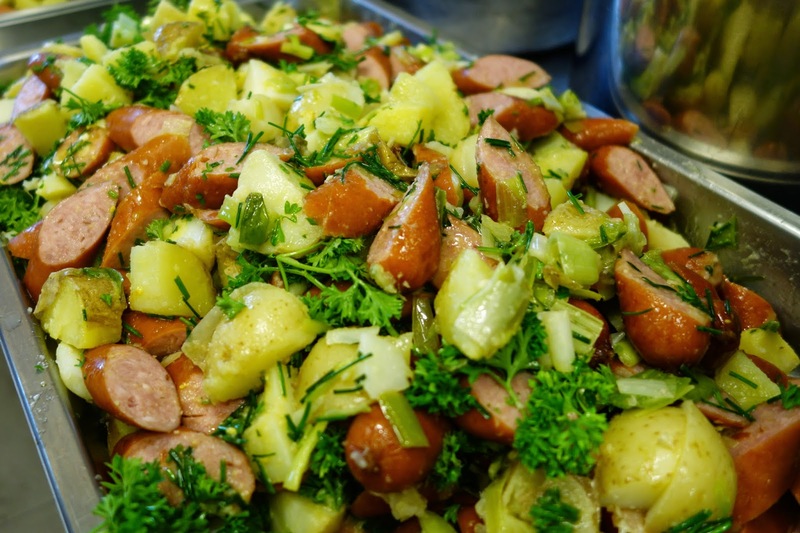 That said, from planning, preparation to execution, if you do all the little steps right, you have a better assurance that the food will turn out well, even if many pairs of hands will be cooking alongside yours. 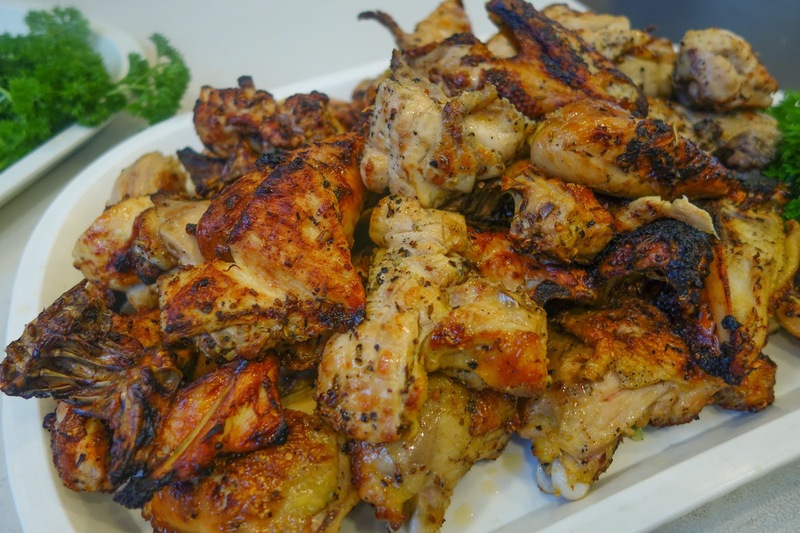 In this post, I will start with a BBQ party we hosted for 150 pax at our Alpha Celebration Dinner. Ed notes: More information about the Alpha Course can be found here and if you'd like to join the one held in my church, go here. This post also acts as cooking notes for my church's Food Ministry team. The first thing is to plan the menu. Your items need to go well together. Imagine the food all on the same plate. That is how your guests are likely to eat. 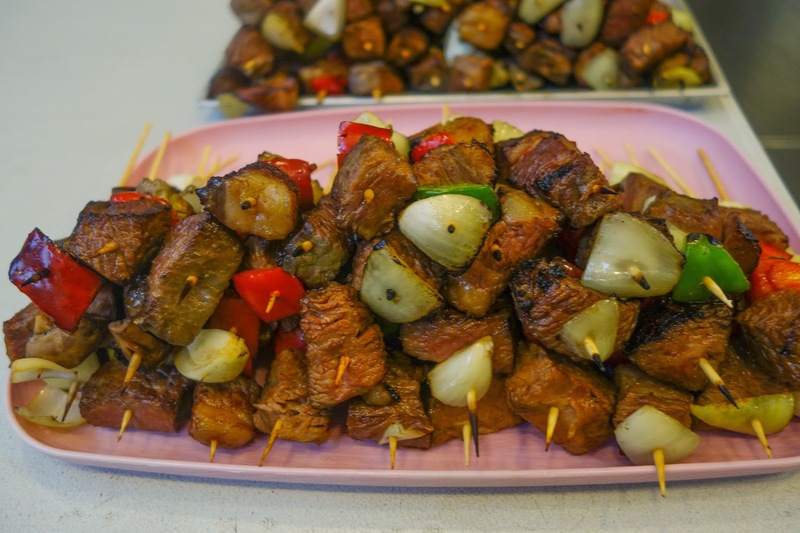 So if you make chicken satay, sweet Taiwan sausage, a carefully marinated teriyaki beef and cold potato salad - all your efforts are likely to come to naught as your guests will be mixing up all the food and sauces together. This is why you should start with the guests plates in mind. If you want to do satay, then do meats and veg (cucumbers, onions) which go well with the sauce. If I offer satay sauce, then I won't bother with marinating my other meats with flavours which may clash. Alternatively, offer your satay sticks, condiments and sauce in a separate plate or bowl if you want to guide the way your guests eat. At the recent party, we decided to go Western in the main, aim for fresh ingredients and avoid marinating with too many strong flavours. One will normally think of meat, seafood, veg and carbo (rice, bread, potato). Here in Singapore, as good meats don't come cheap, you need to think of your source. As you can see, there is a good mix of meat protein, carbo and greens. 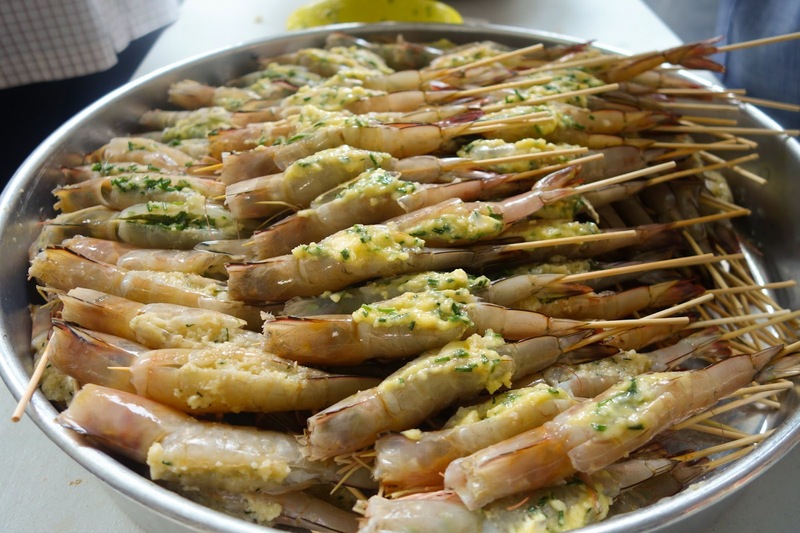 We would only use large Angka prawns if we can source it at a good price, which we did. Going the kebab or "sticked" approach is a good way of "plating" your food, i.e. you want the guest to eat the meat and veg together. It does elevate the oft neglected grilled veg in BBQs. This also mean that the more costlier and richer meat like beef is enjoyed in the right proportion. 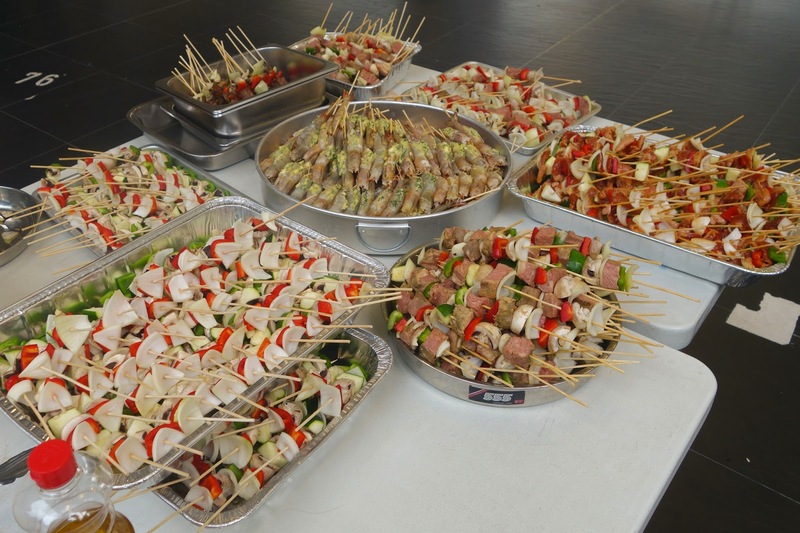 It is also a very neat way of grilling and serving, especially for a large party. The Char Siew marinated oysters came free from our regular supplier and we were glad to add it in. I have mentioned elsewhere that short rib beef (and other tough beef cuts i.e. brisket, chuck) is amazing when cooked slow and low. It is also significantly cheaper then the tender cuts (rib eye, sirloin, tenderloin). 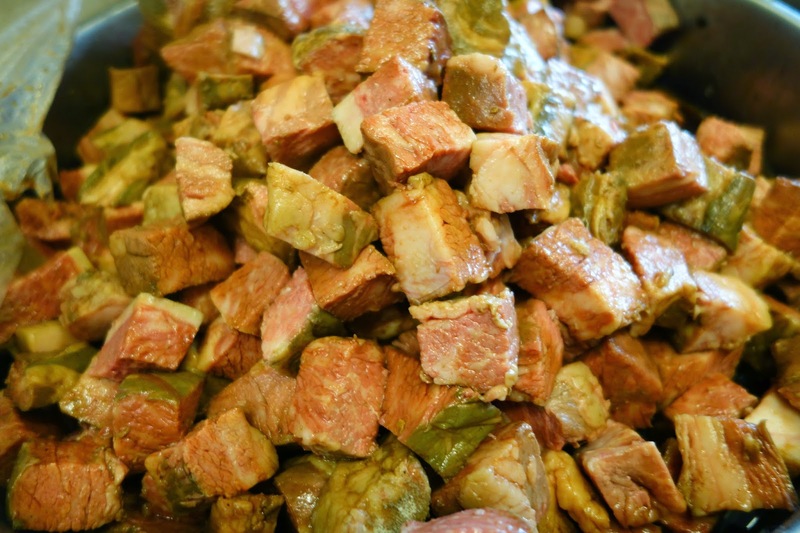 Whether grass or grain fed, after cooked for 36 or 48 hours at 55C, it is tender and the flavors are rich. As it is already cooked, all it needs is 2 minute on the grill for the searing and it is good to go. Guests will think they are enjoying expensive beef but you will know that the trick is in the right preparation. If you have a Sous Vide gadget and planning a BBQ, this just makes a lot of sense. As the beef is flavorful, you don't need to marinate heavily. Just a bit of salt will do after or as you grill. For this batch of beef, I prepared a soy-based sauce. When the beef is sous-vide cooked, remove it from the vacuum bag and empty the sauce into a small pot. Cut the beef into cubes. Simmer the beef juice and strained away the scum. We add some discarded veg parts (leftovers from the kebabs), soy sauce, sugar, pepper and cooking wine. Simmer for about 10 minutes. Then add to the beef to marinate. 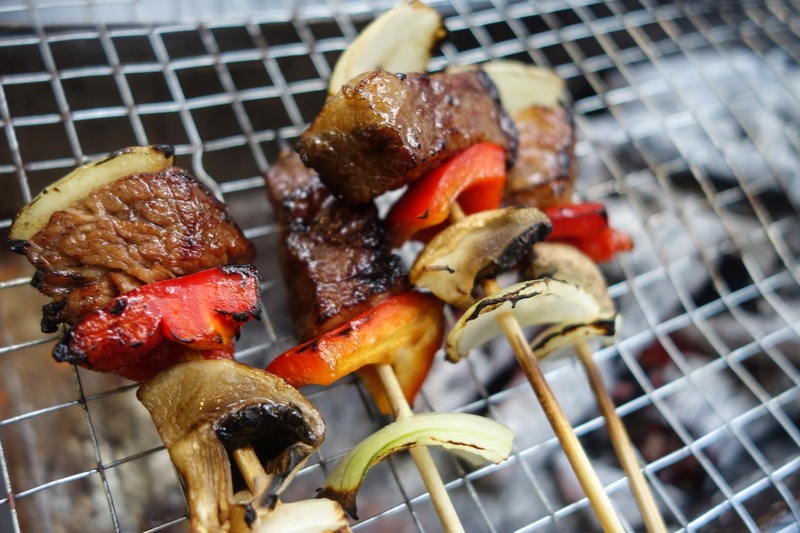 When sticking the beef kebab, remember that onion pieces hold better when grilled compared to mushrooms or green pepper. So, add the onions first and last. I bought this batch of boneless short rib beef from MMMFresh. I sometimes buy it from the wet markets. Some beef stalls sell good New Zealand beef. The tendon has to be trimmed but keep the fats on. For 8 kilos of rice, I used about 200 gm of butter, a few stalks of rosemary, 3 star aniseed and 3 tablespoons of salt. Heat the butter first in the rice cooker and add the rest in. After about 2 minutes, add the rice and mix. Then add water (1:1 ratio) and cook. This is not as difficult as it may seem. Dice the leek. Add some olive oil to the pan or wok, some chopped garlic and cook the leek. About 10 minutes. Meanwhile, in a bowl, add some olive oil, mustard sauce, salt, chopped English chives, finely diced white onion, wine vinegar. Taste to get the balance right. Add the cooked leek into the sauce. Note that mayonnaise is not used in this dish. For the potato, get those suitable for making salads. Boil it but remember not to overcook it. Slice. Grill the sausages: 180C for 10 minutes. Slice diagonally. Mix everything together. Cover with foil to keep it warm. Garnish with parsley just before serving. There is really no need for me to give you the amount to use. Do think a bit and proportion it yourself according to the no of people you are serving. Adding some sliced boiled eggs is fine too. The rest of the menu should not need specific info and I am sure you can figure out how those are prepared just by looking at the photos. Remember to cut the veg squarely to fit nicely into the kebab sticks. As for grilling, the charcoal needs to be prepared at least an hour in advance. You are using radiation heat to cook, not direct flames. For a large party, it is advisable to half-cook the food first. What was the cost per pax for this BBQ? We kept it well within $10, at about 7-8 per pax. 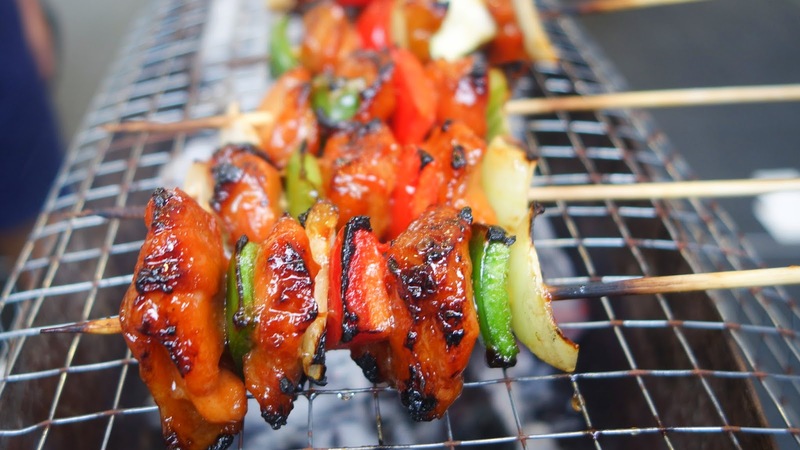 With good planning, you can certainly enjoy a good and affordable BBQ party. Check out more photos below. Keep an eye on this BBQ series. I will be posting some other recipes and techniques on food preparation. Anxin Chicken - marinated in mixed herbs, fish sauce and some olive oil.